All rugs are authentic vintage Persian rugs. The carpets are treated with great care and are hand made. This results in a unique contemporary carpet. In addition, our suppliers use 100% eco friendly materials. 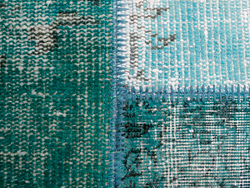 Each rug has its own unique design and color. There are also carpets where only the colour is removed exactly, which gives a very nice effect. The rugs are carefully cleaned and repaired before they get their new colour. The patchwork carpets are fitted with a sturdy undergarment and festoned with the greatest care. Viteaux Originals rugs have been collected from all parts of Anatolia (Turkey) with a historical background of up to 50 - 100 years. They tell us forgotten stories from different times and places. The famous Persian carpets are among the most sought-after interior items all over the world. Their rich colors, warm tones, extraordinary patterns and traditional motifs have contributed to the status that Persian carpets have been since the 13th century. Even Marco Polo, who traveled through Anatolia in the late 13th century, wrote about the beauty and artistry of the carpets in his book Il Milione (english title: The wonders of the Orient). It is not inconceivable that today we are looking at the same carpet design patterns that Marco Polo praised in the year 1272 and brought back rugs with him to his home. The rugs are all made in different periods by different cultures. Because of the multi-reflection of cultural Anatolia these carpets can be viewed as a mosaic. Therefore, these carpets are special and and is a musthave in your home, whatever the style is.